Traveling to Brazil for the 2014 FIFA World Cup, or just headed out to your local beach for a daytrip? You remember to pack your sunglasses, a hat, and plenty of sunblock, but don’t forget that your mobile gadgets need protection too. That free WiFi HotSpot could get you in hot water! Spectators at the 2014 FIFA World Cup Brazil will have lots of choices of free WiFi. At least 6 of the 12 World Cup stadiums have access to free WiFi built in, and planners have created WiFi hotspots across 2,300 access points, including parks, squares, and public transit stations. Fans not watching in person will check scores on their phone or watch live streaming matches by connecting to free WiFi at hotels and bars. “A WiFi attack on an open network can take less than 2 seconds,” tweeted @ExtremeNetworks recently. Cybercrooks can access and steal your personal data when you connect to these unprotected networks. Having your identity stolen and bank account emptied out while on vacation could ruin any trip - even one to paradise! “Hackers target public hotspots, where it’s easy to follow every move that users of the WiFi connection make, allowing them to access emails, passwords, documents, and browsing behavior,” said Vincent Steckler, Chief Executive Officer of AVAST Software. Use a VPN service to make sure that doesn’t happen. avast! SecureLine VPN protects your privacy by making your logins, emails, instant messages, and credit card details invisible to spying. You can get avast! 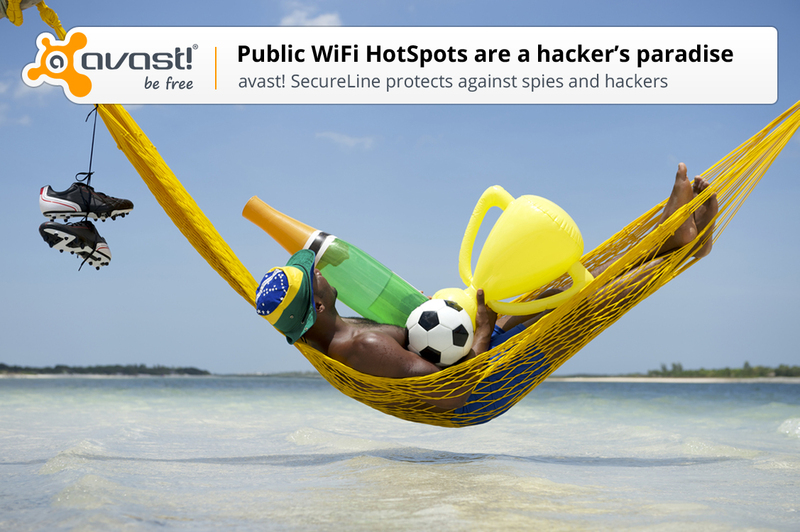 SecureLine for your laptop in all of AVAST’s free and premium products. We also have avast! SecureLine for Android phones and tablets and iOS devices, so you can securely use your PCs, smartphones, and tablets on unsecure WiFi networks while traveling or in your favorite cafe. Want to live stream a match on your PC, tablet or phone? How about relax and watch a movie from Netflix? A benefit of avast! SecureLine is that it makes you look like you’re connected from a different location, which allows you to view ‘local’ content anywhere. Simply choose which country you want to connect to. Choices are U.S., United Kingdom, Germany, the Netherlands, Czech Republic, and Singapore. When you’re in an unfamiliar city, especially one with a reputation for crime like São Paulo, travel experts caution visitors about flashing valuables, like wads of cash or mobile phones, while on the street. People may not feel safe pulling out their shiny phone or tablet to use free WiFi. 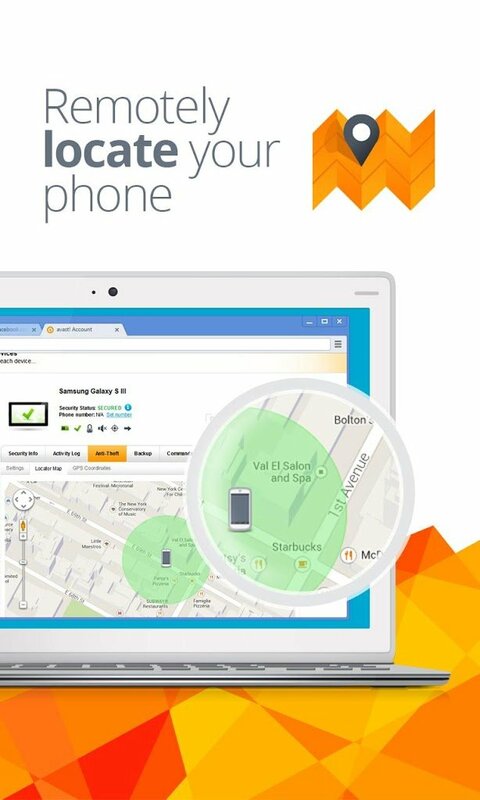 If you do happen to get your phone swiped by a kid on a bicycle or lose it somewhere, then avast! Anti-Theft can help you track it down. avast! Anti-Theft is a separate program included in avast! Free Mobile Security. This little program will help you recover your phone by controlling it remotely with SMS commands or via the internet by logging in to your AVAST account. Read about it in our blog, Lost your phone? avast! Anti-Theft helps get it back! Get avast! Free Mobile Security from the Google Play store! You can also install avast! Anti-Theft as a stand-alone app from the Google Play store!